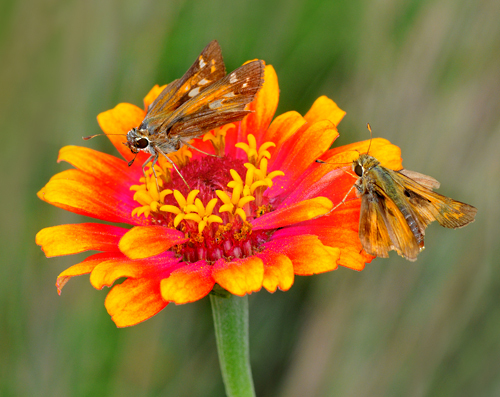 My neighbor, dear friend and frequent photography companion, Michael Powell, challenged me to get a shot of these tiny moths in my garden yesterday afternoon. They were on the edge of a leaf of one of my many Rose campion (Lychnis coronaria) plants (they self-seed all over the garden). Combined (and yes, they were combined), the moths barely measured an inch in width! 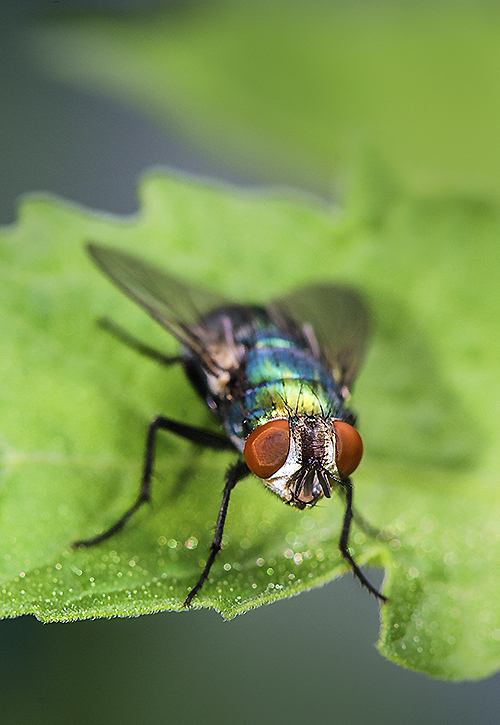 If you’re familiar with depth-of-field in photography and how it works, you’ll know that the closer you get to the subject (and the tinier it is), the areas in focus become extremely shallow. I was directly overhead shooting these two moths and they were visually on the same plane, but it was difficult to get a shot where almost everything was in focus. This was my best shot and I’m happy with it overall. I still haven’t identified what kind of insects they are. Michael and I are fairly certain they are moths, but we could be swayed otherwise with a more official identifications. Takers, anyone? UPDATE: Thanks to Jane Auty Kirkland (author/photographer of the Take a Walk Books series), for identifying these little moths. 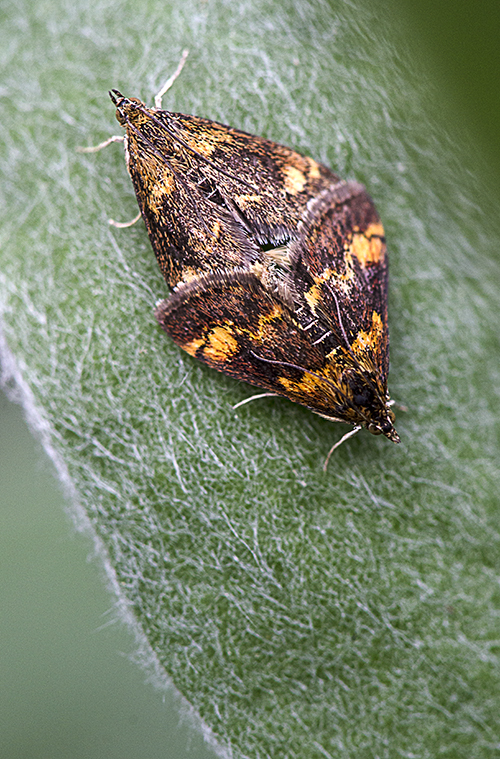 She has identified them as Orange Mint moths (Pyrausta orphisalis). Check out this link here for clarification. Some of you may have noticed that my photographic style is very graphic and sometimes minimalist—clean lines, stark composition, judicious use of light, pops of color, selective depth of field, and employing varying degrees of bokeh. Well, capturing a “plant portrait” of Queen Anne’s Lace (which I have avoided until now, believe it or not), isn’t easy—and it’s a hard flower to fit into my more graphic style. It’s a very delicate flower with hundreds of little flowering brachts spread over a wide, curving surface—making it hard to control the depth of field across the entire flower. I hung in there yesterday and experimented with it—resulting in a shot that I rather like—and that still suits my photographic bent! 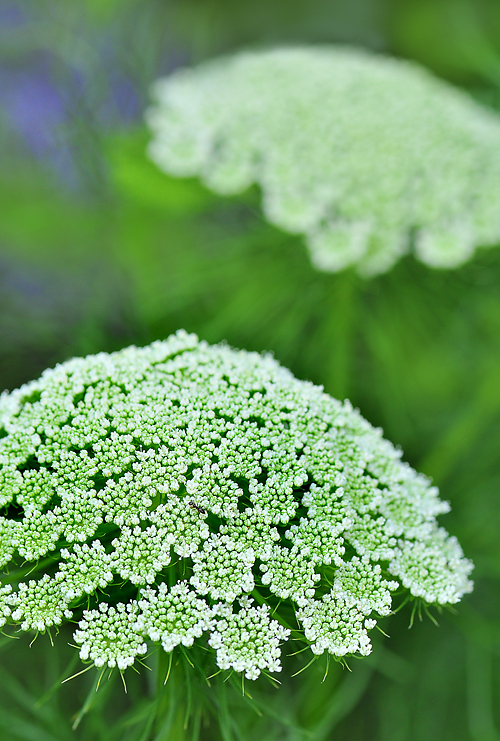 Queen Anne’s Lace is sometimes called Wild Carrot—in fact, the carrots we eat were once cultivated from this plant. Lacy, flat-topped clusters bloom from May through October. It is a biennial plant, meaning it lives for just two years. 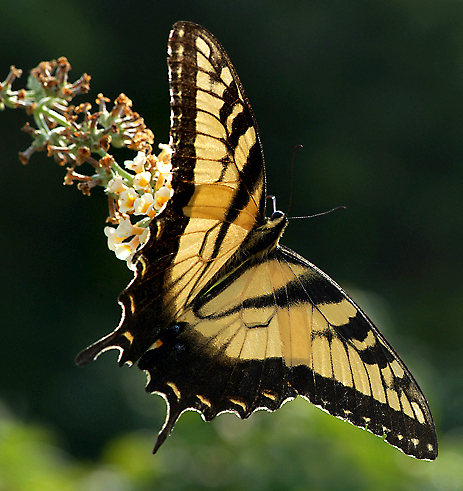 Although many people consider it an invasive weed, many insects benefit from this wildflower—caterpillars of the Eastern Black Swallowtail butterfly (right) eat the leaves, bees and other insects are drawn to the nectar, and other insects feed on the aphids that inhabit the flowers.